The enthusiasm, the energy. Right down to the engine. We took our time with the Accord. Featuring the Earth Dreams Technology*, the Accord is able to lower fuel consumption that doesn’t compromise performance, but awakens enjoyment. Earth Dreams Technology is a suite of advanced technologies that enhances both the driving performance and fuel economy, thus offering the driver more torque with better fuel efficiency. Designed to dramatically reduce low frequency noise in the cabin and control the engine order sound in a linear way, so you can enjoy a serene drive every time. Reduces unnecessary gear shift-up in cornering and supplies acceleration immediately after making a turn. The paddle shift system allows you to change gears manually without removing your hands from the steering wheel. Forget conventional luxury. Set yourself apart with a car that does it all for you. Form in function and substance in style.All is pleasant to the touch. The Accord is carefully refined.So you can enjoy your most powerful virtue. Time. The Honda Accord is the outcome of our all-out pursuit of sedan excellence. The result: a bold exterior with an air of luxury, yet with a sporty youthful feeling. Door mirrors with side turn lights add a dash of style to safety. The Accord is elegantly designed with 18-inch diamond shaped multi-spoke alloy wheels. Ensuring safety, the lights automatically illuminate when the steering wheel is turned at a 90 ° angle radius. The Accord energy-efficient LED Rear Combi Lights feature a strong aerodynamic design that provides better visibility for drivers at the back of the vehicle. MULTI-ANGLE REARVIEW CAMERA** The Accord features a 180° wide and a clearer multi-angle option for a most preferred view to give ease for safer reversing, displayed on the 8-inch Screen. TECHNOLOGY (G-CON) The Honda’s G-CON technology impact absorbing structure minimise injury to passengers in the event of collision. HILL START ASSIST Helps to prevent the Accord from rolling backwards when the brakes are released on an incline. ANTI-LOCK BRAKING SYSTEM (ABS) Each disc brake on the Accord comes with anti-lock. The ABS prevents wheel lockup and helps the driver retain steering control and handling during hard braking. EMERGENCY STOP SIGNAL The rear brake lights and hazard lights automatically flash when the Accord detects sudden braking at unexpected road conditions or situations as to warn nearby cars. VEHICLE STABILITY ASSIST (VSA) & MOTION ADAPTIVE ELECTRIC POWER STEERING (MA-EPS) AUTO WIPER* The Auto Wiper automatically activates when it starts to drizzle or rain. Priced at RM139,800 (2.0 VTi), RM149,815 (2.0 VTi-L), and RM172,817 (2.4 VTi-L), the new Accord will be assembled locally at the company’s manufacturing plant in Pegoh, Melaka, and will come with a five-years warranty with unlimited mileage. As much as the Accord’s exterior is concerned, it is shorter, lower, and wider than its predecessor. While the overall length is shorter by by 80mm, the wheelbase is 25mm shorter, standing at 2775mm. Despite the decrease in length, there is more cabin space (rear leg room has increased by 35mm) and luggage space now. Under the hood, the 2.0 variants get the same SOHC i-VTEC engine as the outgoing model. However, the engine has been tweaked to be more fuel efficient (by 10 per cent). Paired with a five-speed automatic transmission, the powerplant is capable of kicking out 153hp and 190Nm of maximum torque. The 2.4 VTi-L variant on the other hand gets a brand new ‘Earth Dreams Technology’ DOHC i-VTEC engine, which produces 175hp and 225Nm of maximum torque (2hp and 3Nm lower than the outgoing model). According to Honda Malaysia, the new engine, which is paired with a five-speed automatic gearbox, is more fuel efficient than the outgoing 2.4 Accord by seven per cent. Standard features in all variants include LED daytime running lights, touch screen audio, dual-zone air conditioning, rear air-cond vents, parking sensors and 17-inch wheels. For the first time, the Accord comes with an ECON mode button as well, similar to the one found in models like the Civic, CR-Z, and CR-V. While features in the 2.0 VTi-L include keyless entry, push start ignition, cruise control, Bluetooth connectivity, leather seats, powered driver’s seat, GPS, and a reverse camera, the top of the range 2.4 VTi-L comes with Honda LaneWatch , auto-leveling LED headlamps, paddle shifters, auto dimming rearview mirror, a premium audio system with a subwoofer, and 18-inch wheels. Having received 330 bookings so far, Honda Malaysia said that it aims to sell 2,800 units this year, and to establish 16 more Honda dealerships nationwide by end of 2013. 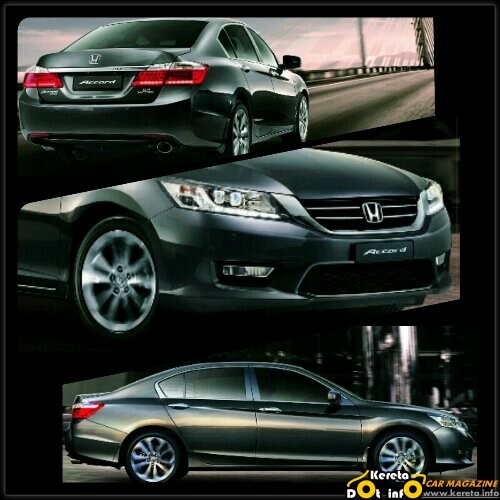 Accord baru 2013 2014 Malaysia.